There’s a very good reason why so many musicians have switched to Studio One. 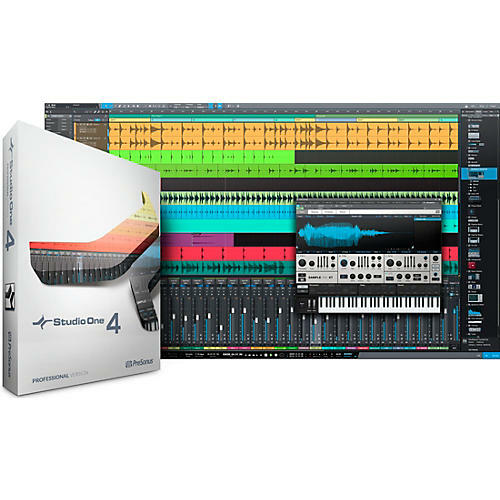 Built on a modern foundation that’s not bogged down by legacy code, Studio One provides an efficient, creative companion from initial inspiration to final master. Its efficient, single-screen interface houses an unlimited number of tracks, intuitive editing tools, advanced virtual instruments, mastering, and video player—you spend your time creating music, not wondering what to click next. The 64-bit double-precision mix engine is state of the art, while the smooth, analog quality of the virtual instruments comes from proprietary techniques that provide much higher controller resolution. The reason why Studio One resonates with musicians is simple: PreSonus listens. Many new features in Version 4 are the direct result of user feedback, including AAF import/export so users can bring song data from their old DAW into Studio One. Add the most flexible arranging tools of any music program, full integration with Notion for superior notation, over 20 GB of carefully curated content, analog console emulation, advanced step sequencing, unified hardware control with the FaderPort series of hands-on controllers, and much more—it’s no wonder that Studio One continues to gain new followers every day.